Karin did an exceptional job for us. We engaged her to develop a space plan for an underutilized back room. Her plan allowed us to add a full bath, a great laundry closet and still left space for a sun room. Her company did all of the construction work and we managed to upgrade our existing bath in the process. We feel like we have four beautiful new rooms in our home. Each step of the way, Karin was attentive to every detail. We love our new home! Thank you, Karin! Thank you for your kind words, Kay and Sue. We were thrilled to collaborate on this project with you, and hope you enjoy your new renovated space for years to come. Karin was wonderful to work with. She gave us 2design alternatives. She was very responsive to our need for storage options and there were no surprises. We will recommend her to friends and family! It was a pleasure to work with Karin Fisher. She is creative, professional, and completed the work on our master bath on time and on budget. We would recommend her without hesitation and hope to work with her again on future home improvement projects. I have done many kitchen and bath remodels over the years and working with Karin Fisher of Fisher Gross Kitchen & Bath was refreshing! 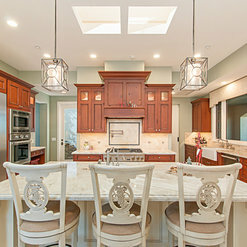 This was an extensive kitchen and bath remodel, a complete reconfiguration of the spaces. What I really appreciated was Karin's attention to detail, her willingness to listen to my vision for the spaces and the ideas and options she offered to make it possible. 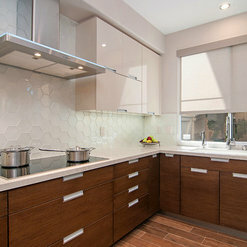 The end results were beautiful, custom contemporary bathrooms and chef's kitchen! Karin's knowledge, patience, professionalism and hands on approach are rare in the remodeling industry. 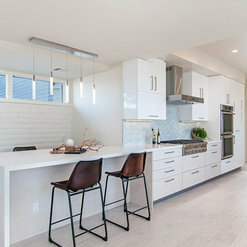 I would definitely recommend Karin Fisher to anyone looking to remodel a kitchen or bath. 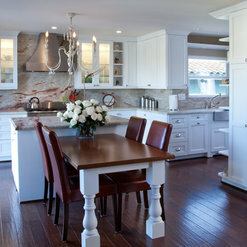 I will certainly look to Karin's services for any future kitchen and bath remodels! We hired Karin after having spent several years thinking about renovating our kitchen. We were looking to hire a design and build firm, and had passed her storefront on walks in our neighborhood. When we met with Karin, we were very impressed. She was extremely professional, organized, and knowledgeable. She provided 3 renderings of the kitchen and bathroom for her consultation fee. She suggested solutions for space utilization that we would never have thought of, and brought us into her store to demonstrate how the various cabinets functioned. She also allowed us to contact some of her former clients in order to discuss their experience with her and her build team, which was extremely valuable, and unanimously positive. One of her builders suffered an unfortunate health issue during the construction that halted work for a time. We had become friendly with the builders so this was an extremely sad incident and could have ended work on the project for a while. Though it was not expected, Karin reached out and found other building crews to come in and restart the project. It speaks to her incredible professionalism how she handled this issue, and for that I will always have the utmost respect for her. 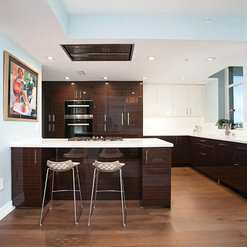 The completed kitchen was everything we had hoped for and more, and we are detail oriented people! We should not have been surprised, however, because Karin would stop by once (and more often) twice a day, to assess the progress of the job and make certain that all was being built to her standards. As an example, the punchlist at the end of the work was not an afterthought; it was completed promptly and without any questions. This was not our first experience with renovating a home, but it was by far our best experience. 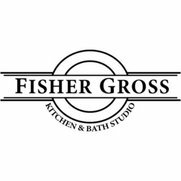 We wholeheartedly recommend Fisher Gross for any kitchen or bath renovations. We live in our kitchen now-- and marvel at its beauty every day. Karin Fisher with Fisher Gross Kitchen & Bath Studio came highly recommended to us after a friend utilized her services on his own kitchen. 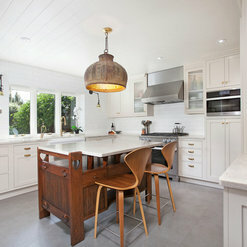 We were very happy with Karin's suggestions and incorporated nearly everything she suggested into our kitchen remodel. More importantly, I had to be out of town during a portion of the remodel and Karin was willing to come to the work site and confirm the project was being handled properly during the counter top installation. Needless to say, the design vision and execution came off wonderfully! 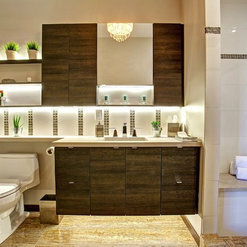 We hired Karin to design and build a master bathroom last year. 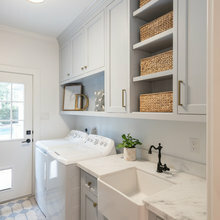 She did a spectacular job maximizing use of space and built designer cabinets. She was outstanding at helping us pick out tiles, paint, trim, fixtures, and appliances. Karin's detail to every inch of our bathroom was superb. I would use her again in a heartbeat. We renovated our dining, kitchen area and we are very happy with the result. 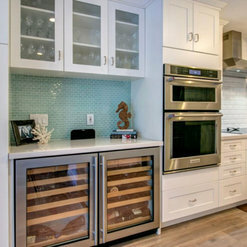 We are impressed by the efficiency, quality and professionalism with Fisher Gross (and her sub contractors, especially the 2 men who install our entire kitchen cabinets in 2 days without compromising quality!) 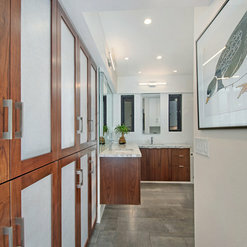 We love that Fisher is a good designer and a general contractor. She came with us to choose our stone, narrowed down choices for backsplash and guided us in picking other design elements. We think it was competitive pricing. Throughout the project, we maintained communication through email, phone and sometimes in person. Fisher or her assistant answers back within a day (most of the time) to sometimes few days (if it goes on the week end). We also love that her design fees were waived when we purchased cabinets through her. From our first meeting with Karin Fisher through project completion we were impressed by her confidence, customer focus, and attention to detail. From design through construction and tying up the loose ends Karin was at our home dozens of times to make sure every aspect of the project was completed to the high standards she holds herself to. During the design phase she gave us 4 different concepts to consider and helped us merge her ideas plus our own into a final design that made the best possible use out of our space. She works equally well with contemporary and traditional styles but is at her best when her client wants a unique, creative home. She tied the design for the kitchen and bath into a larger project that encompassed our entire first level. Any large project will have a few challenges and Karin was always quick to make corrections. She works with the best suppliers and tradesmen in San Diego and it was clear they respected Karin's professionalism and liked working with her. She spent many hours helping us find the right tile and other materials. She understood that this was a large project and wanted us to love our finished home -- and we do. I heartily recommend Karin for any project where creativity and attention to detail matters. Fisher Gross did an outstanding job on our kitchen remodel. I live in a house that's approaching 100 years old. The kitchen was small, dark, and was separated from the living area by a wall. Karin guided us from the initial design to final job completion. The redesign completely opened up the space and has actually made the entire house feel bigger and more open. The quality of the cabinets and counters is amazing. The Fisher Gross team is incredibly professional and they are experts at what they do. They recommended things that I would have never even thought of. I cannot recommend them more! Thank you for your kind words. 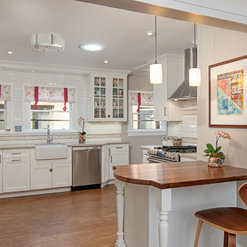 It has been a pleasure working together and we are delighted how the Kitchen Remodel turned out. Wishing you a wonderful day! I have bee incredibly fortunate to have worked with Karen on many projects from kitchens, baths and multiple types of built-ins. .Her creativity, willingness to collaborate, project management and dedication to every client makes her company superior. I look forward to working together whenever I can. Thank you Beverly! We always enjoy working with you too. Commented: cabinet type?Hi. 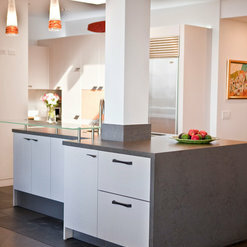 The counters are a natural limestone. You may purchase from Thompson Building Materials - based in Lemon Grove, San Diego. Commented: cabinet brand and finish pleaseCabinets are WoodMode in Gulf Textured Laminate and tall ones in high gloss lacquer. Commented: CounterPaint. I just painted the wall a bright pink. 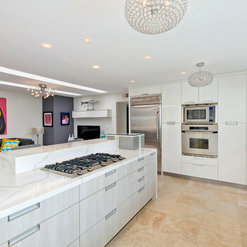 Commented: what material is the backsplash?The back splash is a mosaic made up of Mirror, marble and limestone.